"These chips bake up nice and crisp and pair well with any dip, hot or cold. Sprinkle with any combination of seasonings, such as kosher or sea salt and pepper, cumin, smoked paprika. The possibilities are endless and delicious! I especially like them with a delicious hummus!" Brush lavash with olive oil. Sprinkle with Parmesan cheese. 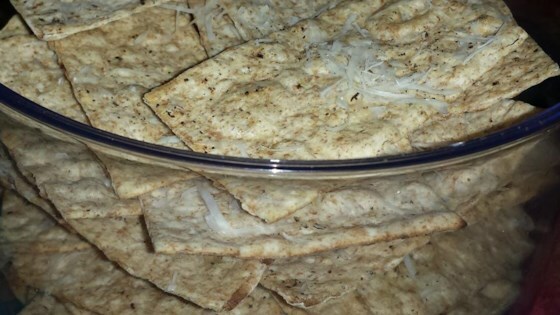 Using a very sharp knife or a pizza cutter, cut lavash into strips, squares, or triangles. Place lavash pieces on a baking sheet. Bake in the preheated oven until crisp, about 10 minutes. Remove from oven to cool completely; store in an airtight container. Serving size is approximate, depending on how big or small you cut your pieces.